This is your chance to grab a front row seat for the whole Simon "Strange and Unusual Hobbies" show, filmed at the Soho Playhouse in New York City. This has never been available before, anywhere, in any format. 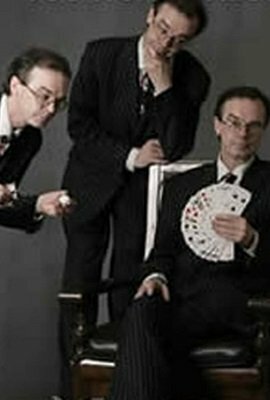 Part con-man, part conjurer and all entertainer, Simon Lovell's 'Strange and Unusual Hobbies' is a show and tell into the devious mind and methods of hustlers, hucksters and cheats. A "raving nutter," Simon's acts of deception are powerful and his execution flawless, as he takes audiences through his wild collection of tricks and cheats. A hilarious and awe-inspiring evening of pure entertainment by one of the most potent and radical innovators in the arcane arts of cheating, practical jokes, off the wall humor and more! Also included is an extended, exclusive interview with the slightly demented and sometimes lightly crazed "Head Lemming," Simon Lovell. This video contains "mature content."